Mouri Ran is a childhood friend of Kudou Shinichi. She is the daughter of Mouri Kogoroui, a private detective, and Kisaki Eri, a lawyer. Her parents got separated when she was seven, and one of her biggest goals is to get them back together. Her best friend next to Shinichi is her classmate Suzuki Sonoko, who constantly teases her about her relationship with Shinichi. After Shinichi's disappearance, Ran met Edogawa Conan, who was introduced by Professor Agasa as a "distant relative" and asked Ran if she wouldn't mind taking care of him at her house. She and her father practically adopted him; Ran immediately came to think of him as a surrogate little brother. 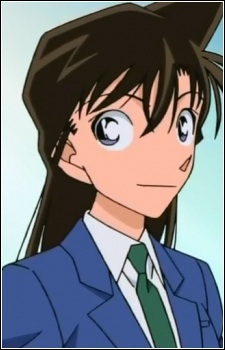 Little did (and still does) Ran know that "Conan" is actually Shinichi. Ran's greatest personality trait is that she genuinely cares for those she loves. She is also patient, kind, and nurturing. Like Shinichi, she highly values justice to the point of idealism. To avoid making Shinichi choose between her and his important case (really an excuse because Shinichi has turned into Conan and can't return), she has decided to wait for him to finish it, trusting his promise that he will come back despite their separation causing Ran a lot of emotional pain. Ran is also very hot-blooded and tends to act on impulses when the people she cares about are involved; the combination of jumping to conclusions and not hesitating to use karate on those who she perceives to have wronged someone have led to several "near-miss" misunderstandings. Early on, she would become violently suspicious if she thought Shinichi was philandering although more recently his confessions have lead her to trust his intentions. Even though Ran is in love with Shinichi, she often fails to convey her feelings because she suddenly becomes self conscious. She can be very brave and resourceful when she wants to be, and rescues Conan from trouble on occasion. However, she has an irrational fear of the supernatural and is thus - unlike her friend Sonoko - absolutely no fan of anything related to the horror genre. She also constantly tries to reunite her father and mother again - though with little success, thanks to the mutual stubbornness of both parents. Men also tend to pay her a lot of undue romantic attention, a fact that makes Sonoko somewhat jealous (and of which Ran herself is completely unaware). Ran is very self sufficient for her age. This is because her father is drunk, slovenly, and fiscally irresponsible. She handles many of the Mouri household's financial affairs and all the cooking and housework. She also ensures Kogorou doesn't slack off on his job, is on his best behavior for client meetings, and she often greets and provides refreshments for potential clients. She is voiced by Giuliana Jakobeit in German.